One dollar and five dollar coins are to be pulled out of circulation soon, Bank of Guyana Governor, Dr. Gobind Ganga announced on Monday. 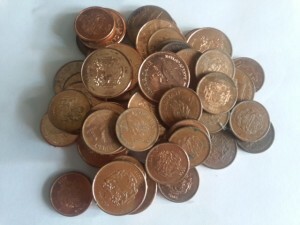 He, however, said an assessment would first have to be conducted before the coins are withdrawn. “We are currently looking at the feasibility of eliminating the one dollar coin of which obviously it has lived its life already; there is no more need for that and we are looking at the five-dollar,” he told a news conference that he shared with Finance Minister, Winston Jordan. The Central Bank Governor said the withdrawal of those coins would have to be done carefully. “We have to be very careful because we do have the decimal system that people have to be educated about,” he said. Guyana also has a 10 dollar coin which has long replaced the 10 dollar note. Also in circulation are the 20, 100, 500, 1,000; 5,000 and more recently the 50 dollar note; the latter being a commemorative note to mark Guyana’s 50th Independence anniversary.